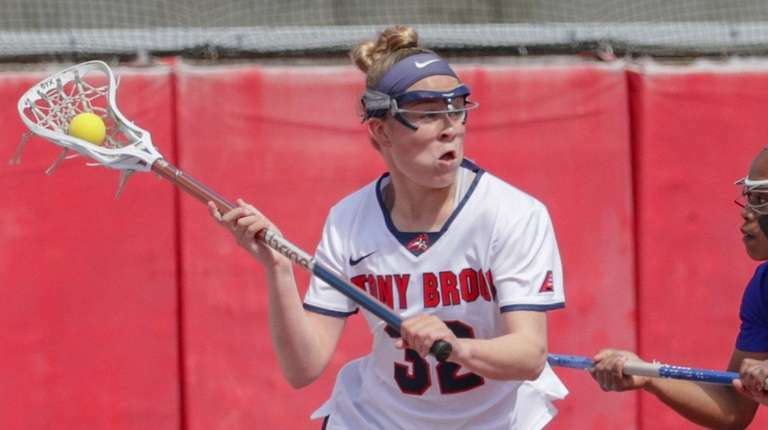 The Stony Brook women’s lacrosse team wasted little time Sunday. The Seawolves scored in the first 30 seconds, and totaled three goals in the first four minutes, en route to their 12-10 non-conference victory over the University of Southern California on Sunday afternoon at LaValle Stadium. Bridget Considine scored off an assist from Sara Moeller 24 seconds into the game. Ally Kennedy had five goals on seven shots to lead Stony Brook. Moeller added four assists and Taryn Ohlmiller had a goal and three assists. Stony Brook (10-4) opened a 4-0 lead in the first five minutes with goals from Considine, Siobhan Rafferty, Kennedy and Rayna Sabella. USC (13-3) answered with six of the final eight goals in the first half, tying the score at 6 heading into halftime. Kelsey Huff scored 59 seconds into the second half to give USC a 7-6 lead, but Stony Brook scored the next four goals — including two from Kennedy — taking a 10-7 lead with 18:27 remaining in the game. The Trojans cut Stony Brook’s lead to 10-9 with a goal from Sophia Donovan with 10:02 remaining in the second half, but the Seawolves scored two of the game’s final three goals, including Ohlmiller’s goal with 2:45 left in the game to take an 11-9 lead. Kennedy added the game’s final goal with 1:43 left. Anna Tesoriero had 11 saves for Stony Brook. Each team had 18 ground balls and 17 turnovers. Rafferty had three goals and Considine added a goal and an assist. The Seawolves have won six straight games after opening the season 4-4 just one year removed from making the quarterfinals of the NCAA Tournament in a 20-win season. Two of Stony Brook’s final three games will be in America East play, before the America East semifinals May 2.